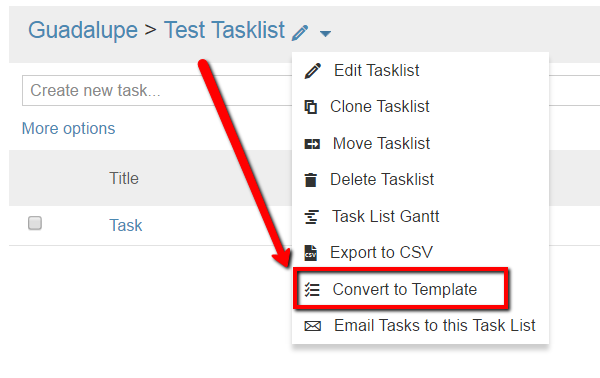 Task list templates allow you to quickly duplicate tasks for standardized processes. All task list templates can be managed and accessed under the company admin menu (gear icon in the top right). From here, select Company Setup > Templates > Task List Templates. Note: Only company administrators have access to the Company Setup area. To create a task list template, navigate to the top right of your screen and select the company admin menu then select Company Setup. Now select the Templates > Task List Templates > Add Task List Template. Using the new template dialogue box, name the template, add a description, and click OK. The newly created template will then be added to the the template list. Click the edit pencil icon to edit the template or select the trash icon to delete it. Note: Users must have Company Admin permissions to access the Task Templates tab. Workspace administrators can create task list templates from existing task lists. To perform this action navigate to the existing task list. Select the edit drop-down menu and then select Convert to Template. Enter a title and description for the template and select OK. The task list template will be created with the name and description details of the existing tasks. Any adjustments to the time details of the tasks can be made at the Task List Templates tab described below. Relative Start Date - to determine the task start date relative to the list start date. Priority - to give the task a priority of high, medium, low, or none. Duration - to set the number of days until the task is due. Budgeted Time - to allot a specific amount of time for the task. This Task Depends on - to designate the task as dependent upon another task. Once a task list template has been created, you can use it to quickly create new task lists in the Project Management tab of any workspace. To create a new task list from a template, navigate to Project Management > Tasks & Milestones > New Task List and select the task list template from the template options below the "New From Template" header. 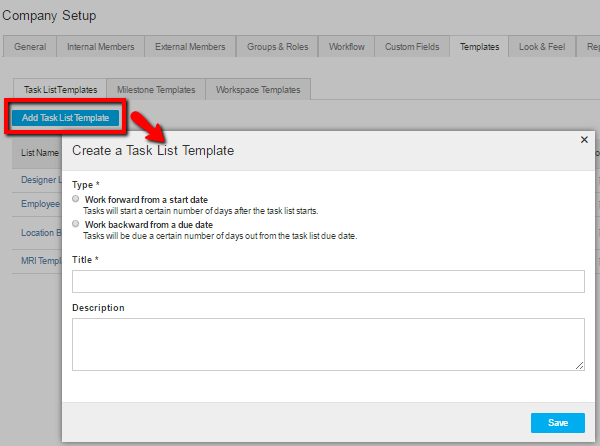 Using the new task list dialogue box, you can name the task list, assign it to a milestone (optional), mark it for internal use only, populate tasks from a pre-existing task list template (by marking the box next to Add tasks from a template and select a task list template from the drop-down menu) and select a start date. Click Create to launch the task list.